Setting up a wireless router is not equal to rocket science. It is a simple procedure which if followed properly will help you set up your wireless router within 15 minutes. You first need to invest in a new router. There are plenty of routers available online and you can compare different models to know which is the best for you. You may need a router with an antenna if you have a large house and need to cover more area. Whichever router you find best, make sure it supports 802.11n or Wireless-N. It is the best router available today that offers stable and speedy network. After you bring home your wireless router, you need to connect it to your modem. This will help you share your broadband Internet connection with multiple devices simultaneously. In order to connect your router with a modem, you need an Ethernet cable. Most routers come with an Ethernet cable. Use it connect the modem to the WAN/Internet port on the router. Now, you will need one more Ethernet cable to connect at least one computer to the router. 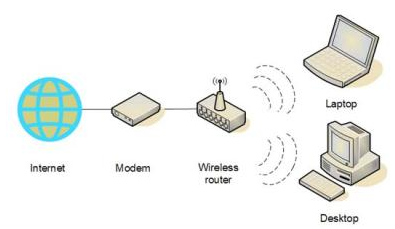 Once you setup wireless router, you can disconnect the Ethernet cable from the connected devices. You need to switch on the router, modem and the computer. Then, open a browser and type in the IP address of your browser. The IP address will be printed on the packaging box of the router or in the manual that comes along with it. In many cases, the manufacturers print the IP address on the device itself. Now, you will land on the router admin page. It will ask you for a username and password. The default will be printed on the device itself, or the box or the manual. Once you enter the router admin page, you need to choose the Wireless settings tab. You will need to enter a new SSID that is unique, as it will be displayed as your network name. Enter the number of devices that can connect to your router simultaneously. Choose WAP-PSK & WPA2-PSK as security. Enter TKIP +AES as the WPA encryption. This will ensure your device is protected from most hackers and intruders. Now, enter a unique more than 8-digit WPA-PSK password. Choose a strong password as it will ensure your device remains protected from eavesdroppers. Click on Submit or Apply and your settings will be saved. Now, try and connect your computer to the Wi-Fi network. Just scan the network on your device, choose your Wi-Fi network SSID and enter the password you saved. That’s it. You can now connect with your broadband Internet connection wirelessly. Remove the Ethernet cable connecting the router and the computer. This is all you need to know about how to set up a wireless router. Just follow these simple steps and with a little bit of common sense, you will be easily connecting wireless routers with your devices.